Discussion in 'Skydentify - What is that Thing in the Sky?' started by Mick West, Mar 8, 2014. The green rectangle is the rolling shutter window - what the camera sees of the scene at any one time, and it builds up the actual photo by reading from this rectangle. 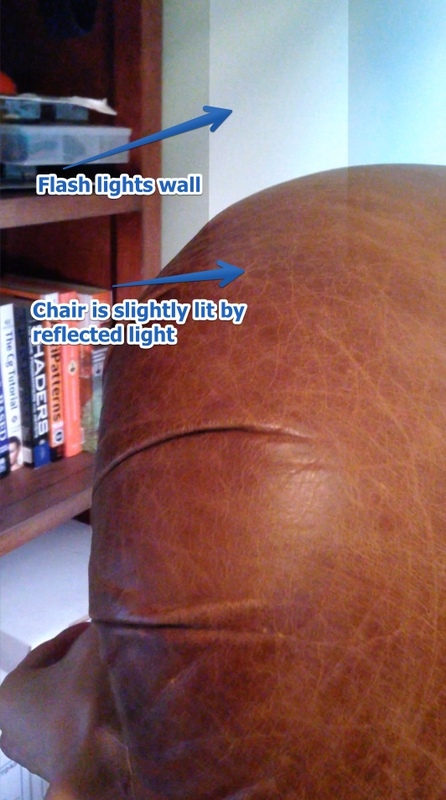 The flash of lighting is very short, but still lights up all the pixels in the rolling shutter window, causing the "beam". Here's what's going on in the first image. Notice the beam also shows up in the reflection. And with the Mayan temple, the lighting is behind the temple, so it only lights up the sky, and not the temple itself. So it looks like the "beam" goes behind the temple. The fact that the "beam" can go "behind" the clouds can seem confusing in a still image. But it's really just that the lightning is behind the clouds, and they are thick enough to block the light. I simulated a similar effect using the flash and a foam pool toy. If the flash is in front of the toy then it illuminates it, and you get the stripe across the toy. 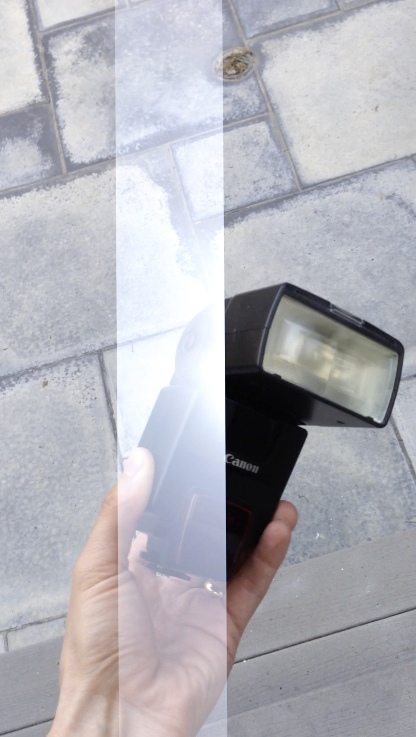 If the flash is moved behind the toy, then the toy is not illuminated, so the "beam" (the stripe of the image) looks like it's going behind the toy. It looks like the flash is not actually working, however you have to remember that for most of the frame, it's actually off. 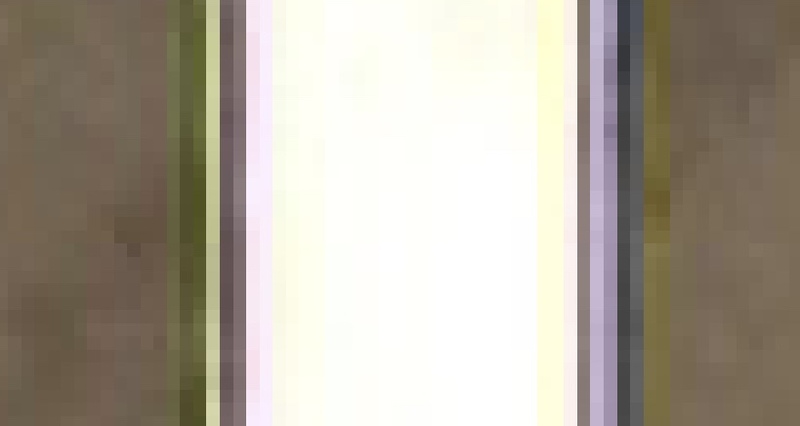 The only time the flash is on is during the white bar. Notice it's horizontal. The image is scanned one row at a time, but when you take a photo in portrait mode, then those rows are the columns. Here the illusion of it being a beam behind the clouds is particularly striking, as a band of dark clouds is partially obscuring the illuminated clouds behind. You can see part of the lightning bolt just below the power lines. 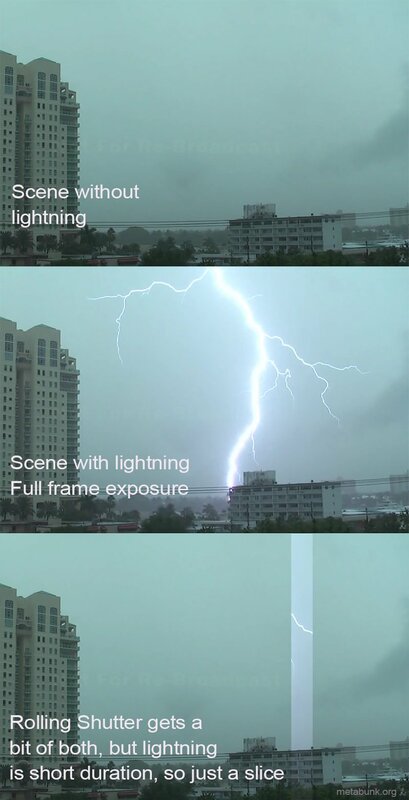 Remember it's not actually a beam of light, it's just a slice of a scene as it would look illuminated by lightening. 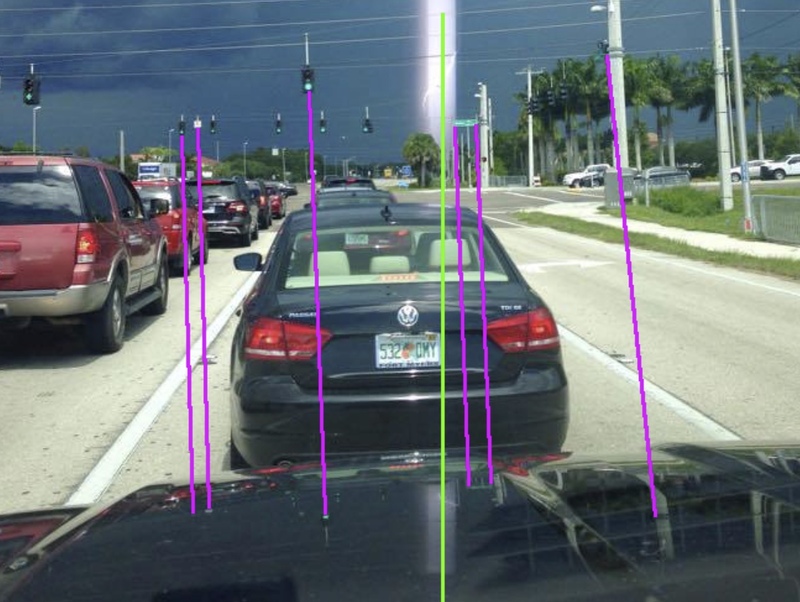 This can be especially confusing when you notice the reflection of the "beam" on the hood of the car. Your brain naturally interpret this as a reflection of the scene, and so you think there's actually a beam in the sky. But if you look closely, you'll see the reflection in the hood is actually of a slightly different are of the sky. The "reflection" lines up perfectly vertically, whereas the nearby traffic signals are sloped. 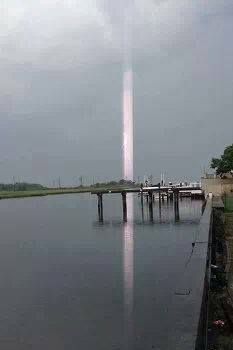 If this actually was a reflection of a beam in the sky, then it would also be sloped. So while it's a reflection of sky illuminated by lighting, it's not the same area of the sky. It's a little unintuitive. A very unintuitive topic here is the width of the band. Why does a long exposure (in a dark setting) give a wide band, but the short exposure (in sunlight) give a narrow band? You would think that if the exposure is short, then more of that exposure would be happening during the flash, so the band would be wider. The first thing here is that the flash I use only has a duration of 1/5000th of a second (0.2 ms), so if things work the way the previous paragraph suggested, then the most we could illuminate would be a band 1/166th the width of the image (in portrait orientation), and yet we see that we can get half or more of the image illuminated. So what's going on? 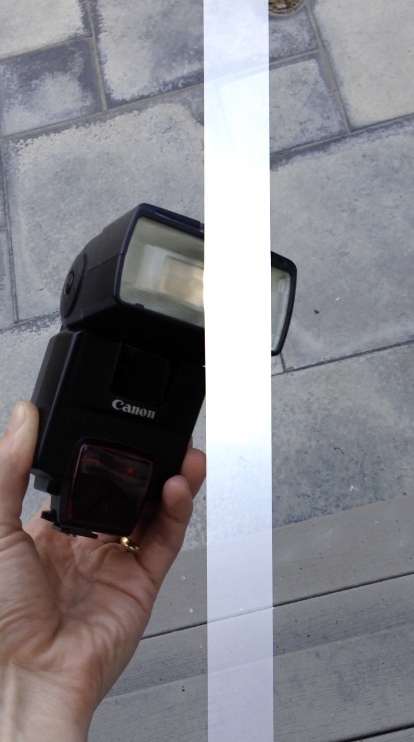 How can a 1/166th of a frame exposure illuminate half the lines in a frame? And why does it it get narrower for shorter exposures? The answer is complicated. CMOS sensors can only be read one line at a time, and yet the exposures can happen simultaneously (or at least overlap). So the reset of each line (the start of when it begins to record) is staggered to match the read-out speed, and the exposure length is actually on an individual line basis. The diagram below is showing the "flash window" - i.e. the portion of a frame in which you can fire the flash and have it affect all the rows. Normally when you use the flash, then it's quite dark and so you have a long exposure, and hence quite a big window in which you can fire the flash, If you were to go outside of this window, you'd get the top or the bottom of the image only illuminated by the flash. Notice the read-out of the lines (green)is the same angle, as that can't get any faster. This also dictates when the reset (blue) happens. But now that the exposure time (red) is much shorter, only a few lines can get exposed during the flash. Hence the "beam" is narrower for a shorter exposure. 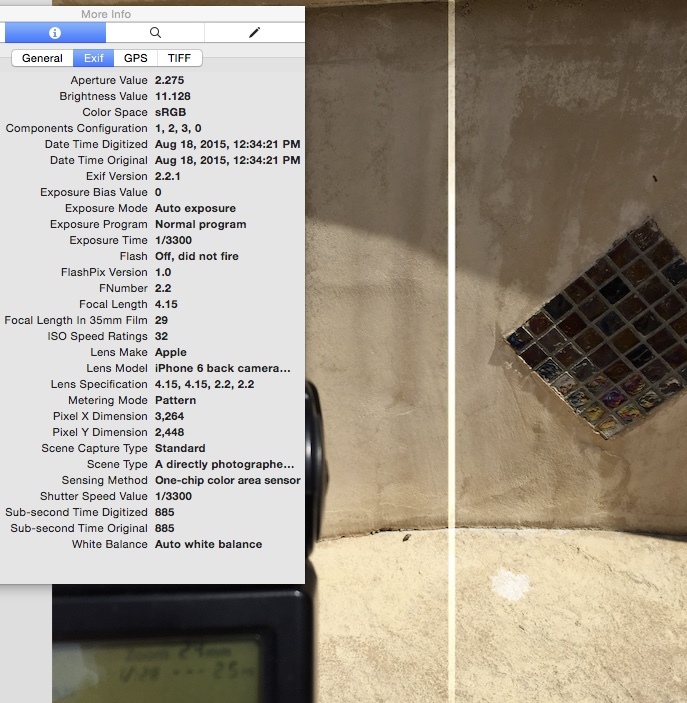 The exposure duration - the red lines above. 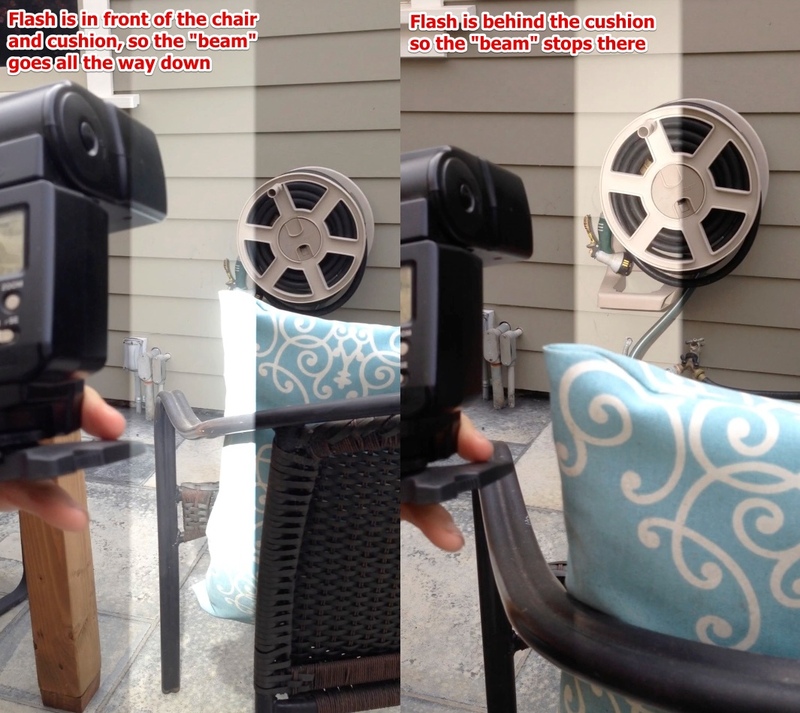 The rolling speed - how quickly does the "rolling shutter" move across the sensor. Determined here by read-out speed - the green line. This gives us a minimum width of the "beam". It's the duration of the flash, divided by the read-out cycle time (i.e. the time between starting two consecutive read-outs). 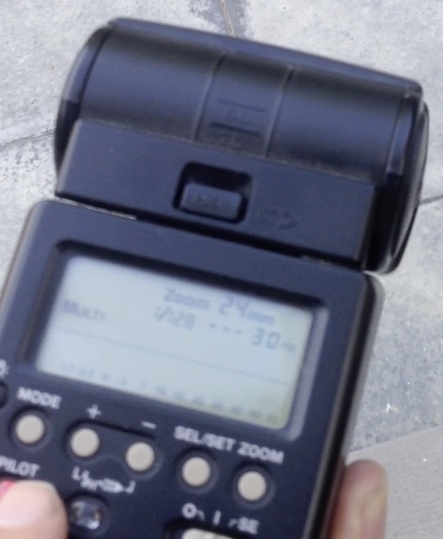 The faster the camera's read-out time, the smaller the potential "beam" and the sharper the edges. Why sharp edges? The start and end of the flash might also occur during the reset or read-out phase of the lines, meaning that line only gets partially exposed to the flash. This means the edges of the "beam" are not always sharp. So we have a 36 pixel wide beam on a 2488 wide image. There are really lines (as the camera is just rotated 90 degrees). Only half the pixels in the middle are a solid bright color - that would be where the flash fell entirely within the exposure time. 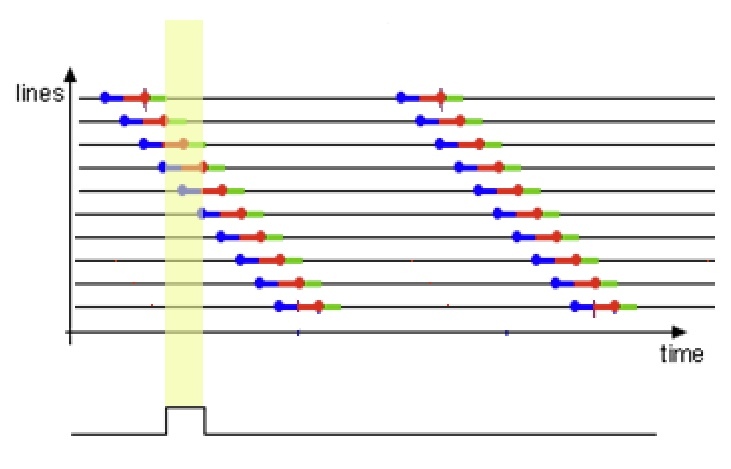 The colored pixels on either side indicate where the flash only partially was within the actual exposure time, with the different colors indicating different contributions from the red, green and blue sensors as they are read at out different times. Why isn't the flare across the whole image, and why does it go behind the jetty in the first one? What I see is some sort of illusion. One would think that if the light source is behind the pier pilon then you would get a shadow on this side of the pilon. Yet the light continues to reflect this side of the pier pilon with no shadow. And without super zoom Mick has it would appear that the joisting and rails of the pier were lit by on the backside of the light source. Anybody know what it is?? 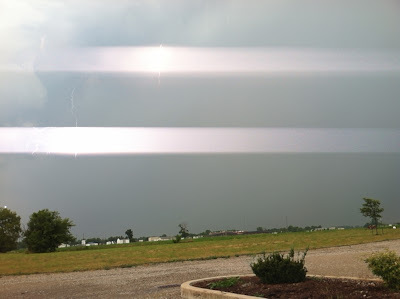 Here's another where lightning produced the same kind of lens flare. I'm not sure if it's because the lightning was so bright, or because I was shooting through the side window of my car, but the lightning is creating some pretty epic lens flares in this photo! I was using Slow Shutter Cam app for iPhone in Light Trail mode with a light sensitivity of 1. EXIF data on Georgies pic looks like it was taken from a phone. youre right, it must be the starship enterprise. I'd like to see the exif data and a high res version but am sure that doesn't exist...I have never had a pic like this of any lightning that I have shot... it could be a lens or sensor artifact.. I'm pretty sure that a reflection won't be able to cast a shadow, not the sort of reflection we see in that image anyway because that's more of an optical illusion dependant on the viewer than a real reflected light. Can't make out the lighting up of the rails on the pier. It looks like a flare, but a flare should obscure over the image, not go behind things. It would be worth hearing if it was sighted optically or just showed up in the picture. Excellent point about the light column being behind un- distorted items in foreground. the items wouldnt be distorted. I can see the lightning reflected in the water which probably is why the pixel issue continues. the real question is why the pyramid beam stops directly at the pyramid. But it might be possible, if you take into account what's happening in the pyramid picture above, maybe the flare only happens over things with a certain image value? Further proof can be found in the fact that the light beam, when isolated in Photoshop, runs absolutely vertical in the image. but I don't know if that works for this picture. I just saw a similar photo on FB except the light was coming out of a pyramid. I'm sure someone else will post the photo, since GMTA. Edit. See that Deidre did. Doh. If that beam were physically there then it's reflecting off an imperfect surface, the river, right? So it would be distorted. It's not, therefore, artifact. I think they mean its a camera artifact. did you message him and ask? 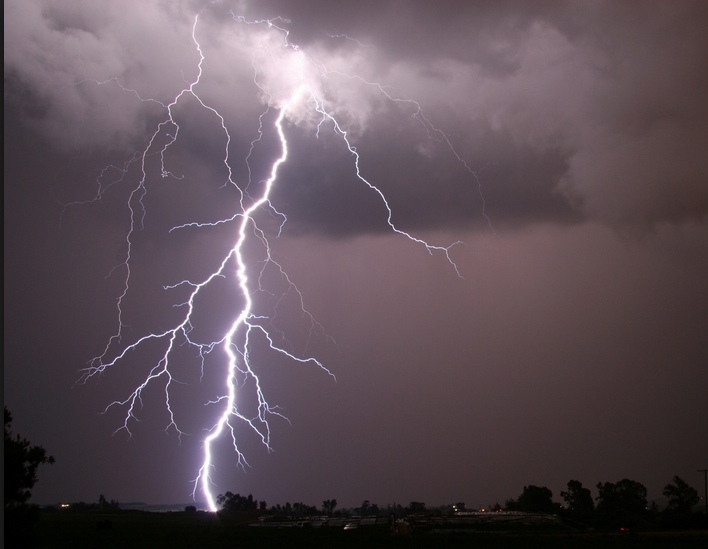 The flair seems to be related to the amount of light being emitted by the lightning. the flair seems to dimm as it gets higher in the clouds and dim as it comes closer in the water reflection. I think it's actually seen in front of the land and trees on the far shore and also the jetty. It's just too faint to see very well against those darker colors. It's lightning. I can't explain the lens flare effect though. EDIT: I made the post without noticing there was an entire third page full of replies. That's the second time I've done this in a week... geez, I'm getting old. 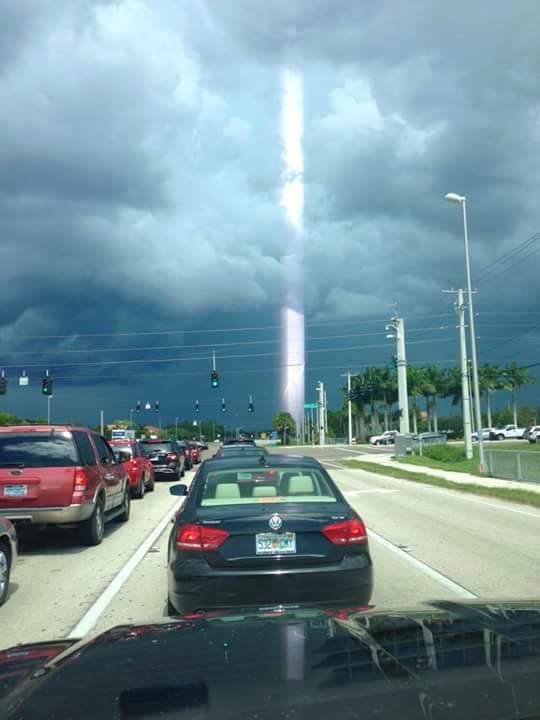 Siliezar, who recently shared his photographs with occult investigators, told Earthfiles.com that he and his family didn't see the light beam in person; it appeared only on camera. "It was amazing!" he said. He showed the iPhone photo to his fellow tourists. "No one, not even the tour guide, had ever seen anything like it before." According to Jonathon Hill, a research technician and mission planner at the Mars Space Flight Facility at Arizona State University, which operates many of the cameras used during NASA's Mars missions, it is almost definitely the latter. Hill works with images of the Martian surface taken by rovers and satellites, as well as data from Earth-orbiting NASA instruments, and is fully versed in the wide range of potential image artifacts and equipment errors. 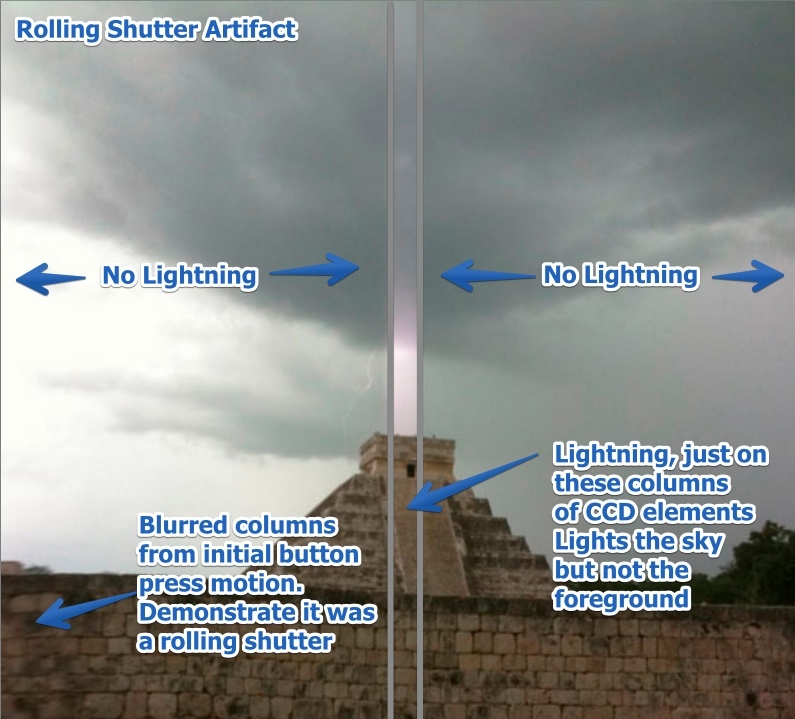 He says the "light beam" in the Mayan temple photo is a classic case of such an artifact — a distortion in an image that arises from the way cameras bounce around incoming light. 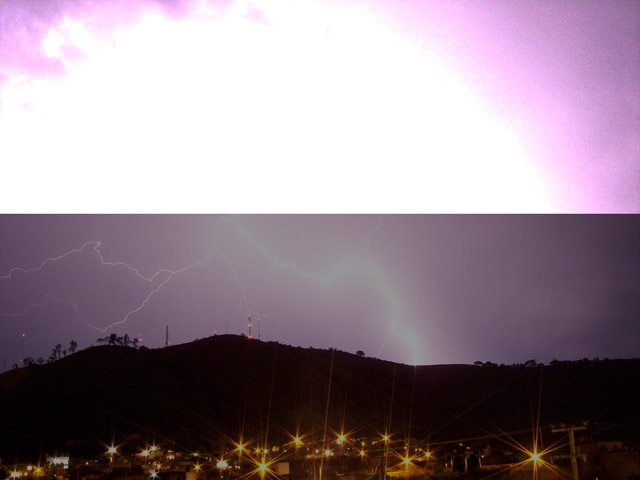 It is no mere coincidence, Hill said, that "of the three images, the 'light beam' only occurs in the image with a lightning bolt in the background. 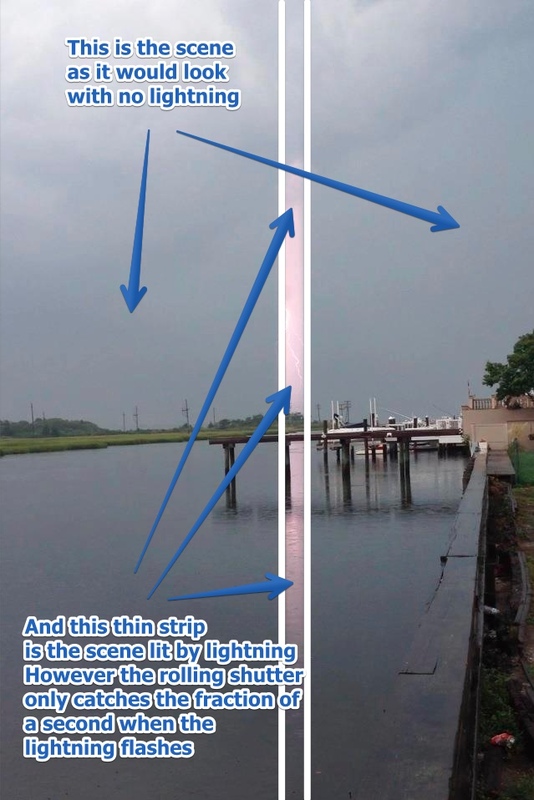 The intensity of the lightning flash likely caused the camera's CCD sensor to behave in an unusual way, either causing an entire column of pixels to offset their values or causing an internal reflection (off the) camera lens that was recorded by the sensor." In either case, extra brightness would have been added to the pixels in that column in addition to the light hitting them directly from the scene. "If accompanying tour guide has not seen such a photo before, it follows that it is the work of Mayan god Kukulkan." 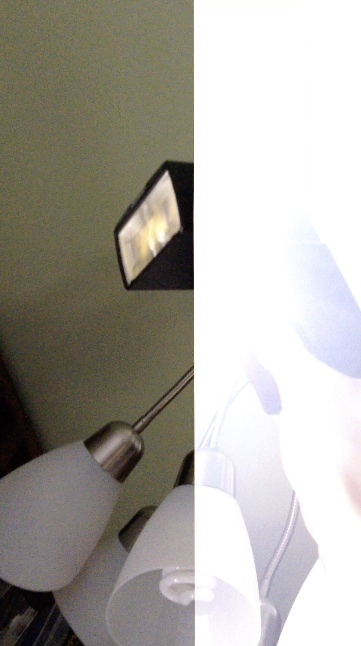 using Slow Shutter Cam app for iPhone in Light Trail mode with a light sensitivity of 1. After seeing your comparative picture, dierdre, and explanation, I'm of the mind that this is "case closed". Seems there are likely to be more and more such image anomalies in the future, as technology advances, and outpaces the layperson's ability to keep up with all of the details and implications. We can't all be experts in every subject. I believe something like this explanation to be correct, but not "causing an entire column of pixels to offset their values or causing an internal reflection " and I have performed some experiments that shed some light. To replace the lightning bolt I used a flash, set to strobe mode, and recorded it with an iPhone 5. What we are seeing here with the flash is an artifact of the rolling shutter in the iPhone, and not a column of pixels going bad, or an internal reflection. This video demonstrates what is going on with a rolling shutter, although it's a little misleading as it assumes the reset and read-out phases are happening simultaneously. Oops, I split the thread without realizing there was another page! I shall merge and reword. Can you replicate it appearing behind darker objects? It's going "behind" the pyramid because what you are seeing is the sky being lit up by the flash. The foreground is dark and facing away from the lighting, so is hardly lit. The OP image has the reflection of the sky. As a long-time Trekker...I fear I must disagree. The color of the Phaser beam is inconsistent with Federation technology. It's not unique to iPhones, it would happen with any camera using a rolling shutter. Perhaps a better way to demonstrate the obscuring would be with the rungs of a ladder? The lack of a physical shutter is not why they use a rolling shutter. It's because they use CMOS sensors, rather than CCD, as CMOS is better for battery life, and easier for a slow phone to process. They could use CCD (or a more expensive type of CMOS) with a global ("total" in your article) digital shutter. Yeah, in the old days of film photography, the difference was between a shutter curtain that was typically used on 35mm SLR cameras which used a rolling shutter and a leaf type shutter which was usually incorporated in the lens for most larger format cameras. I have used medium format cameras that used either technology. In any case, it's an artifact that would be familiar to photographers before the advent of digital photography. I was just commenting on it being called 'rolling shutter' since there's no physical shutter. For digital cameras, the 'shutter' is the interval between a pixel on the sensor starting and ending data collection. Note at 1/1000th, the exposure is a slit that "rolls" over the frame. So if the flash happens during 1 or 3, then you will get a partial-frame illumination. And the faster the shutter speed, the less time is spend in #1, so the more likely a sync problem is. Roll shutter read. Some lines capturing, but again, it's dark. Which is highly unintuitive, and difficult to explain.